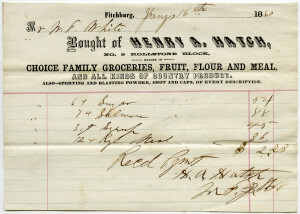 A grocery receipt from the 1860s courtesy of the Old Design Shop, my go-to treasury for vintage images. I love text poems – or SMS poems as I called them in a 2007 incarnation. On a short cob-house building trip to the Eastern Cape that year, I sent text poems from an old-school silver Nokia to various recipients. These became “From the Bathurst SMS Poems” (and may now be read in Shining in Brightness). “Pavement Walker” and “Now here is something to marvel at…” also started their lives on a phone, this time my little Alcatel from Carphone Warehouse. This poem documents a morning shopping trip. A friend of the poet’s offered to lift her to a retail park. Imagine the sender corresponding that she’s en route. The friend arrives but the poet is still pulling on obstinate boots. Then at the shop, the sender’s long completed their shop while the poet continues to wander Sainsbury’s aisles seeking quinoa, spelt and Morning Detox tea. These are my documentary poems of quiet suburbia, where Romanian Eliot’s blueberries arrive in my kitchen via Iceland, to be washed before use.